The objective of this section is to show you a little bit about how you can get started with Bitcoin. 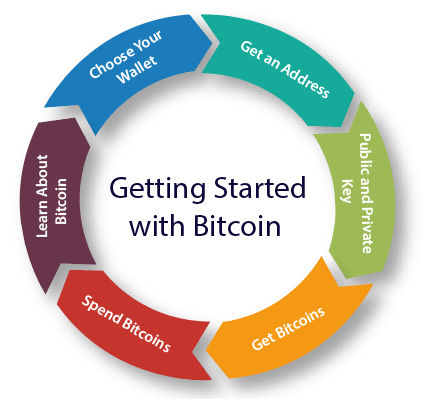 The below image shows you how to start with bitcoin. Bitcoin has some peculiar qualities. It behaves a lot like money, but it is different in the way that it behaves. For example: with Bitcoin, transactions cannot be reversed. Every transaction in the blockchain network is permanent. This makes it different from actually sending money with a bank where you may issue a stop payment or issue a reversal of it's a wrong payment. Bitcoin is also fast and efficient as compared to physical currency. After learning about Bitcoin, the first thing you need to do is to install a wallet. This is a type of software that you install on your mobile device or your computer. It enables you to get into Bitcoin and create your own addresses. An address in Bitcoin is very similar to an e-mail address. This address is used to receive bitcoin. As opposed to an e-mail address where you have just one e-mail address, you can have multiple addresses in bitcoin. It's a good practice to have multiple addresses for different needs. You may use bitcoin address per every single transaction you use. When you open up your wallet, you will receive two valuable pieces of information. One of them is the public key, and another one is the private key. This makes Bitcoin more interesting. With most businesses and different organizations you need to have a password which you share with the people who actually run the organization. So you can click Retrieve my password, and you can get it back. In Bitcoin that's not the case, here you get keys. The public key that you can share with everybody, and a private key that only you know. The private key is an alphanumeric sequence that only you know and with them, you can remain completely in control of all the funds that go into your wallet. Once you have your wallet, you can get bitcoins. There are different ways to get bitcoins. You can earn Bitcoins by doing a job or getting paid. You can buy bitcoins that would mean you could go to an exchange and get bitcoin by put in dollars or whatever currency into Bitcoin. You can also gift bitcoins and can receive them from others. So these are ways of getting Bitcoin. How you actually spend Bitcoin. You can send Bitcoin to anyone. You can use bitcoin over 160000 businesses at this moment Worldwide. Many of the best-known brands Microsoft, Dell take bitcoin as payment. You can also use bitcoin to send payments. This works great if you are actually sending payments to people in different currencies globally. You don't have to worry about having to change into different currencies. You can just pay in Bitcoin, and it's universal around the world.